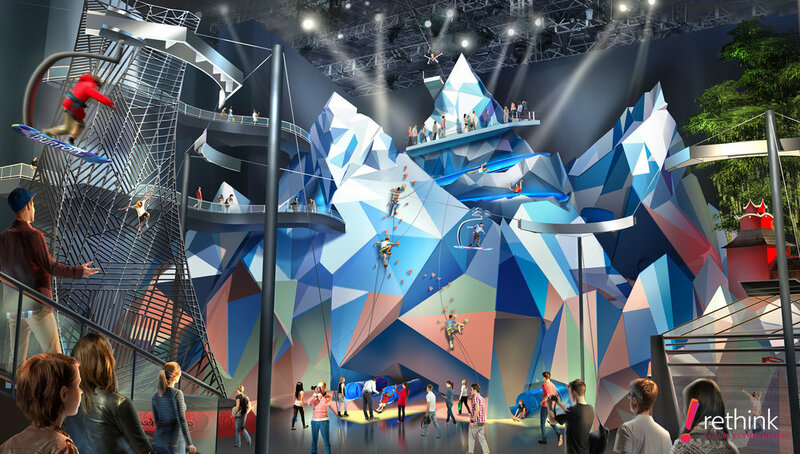 Ibex is a unique and exciting space that invites guests to come together to celebrate the spirit of competition, extreme-style sports, athletic activity, exploration and adventure. This state-of-the-art venue encourages visitors to gather in a highly-social environment for fun and games under one massive roof. Spanning 150,000 square feet over 6 floors, Ibex is broken into 6 zones. These thematic zones are Mountain, Forest, Circus, City, Stadium, and Sky – each name calling out the distinctive design and feel of each area as well as the types of activities and attractions they’re populated with. From the abstract urban streets of City on Ibex's ground floor to the wild gardens of the rooftop Sky zone 120 feet above, there is something for everyone, including refreshing food options and branded retail opportunities. For adult groups looking for a fun afternoon or night out, or kids and teens getting the opportunity to play and explore, Ibex is the perfect place to hang out, push the limits, or simply enjoy the outrageous sights and action taking place in every direction. ©2019 Rethink Leisure & Entertainment, LLC.